It really is quite small. That's it sitting on top of a British penny. I made it from a chip of lime wood. 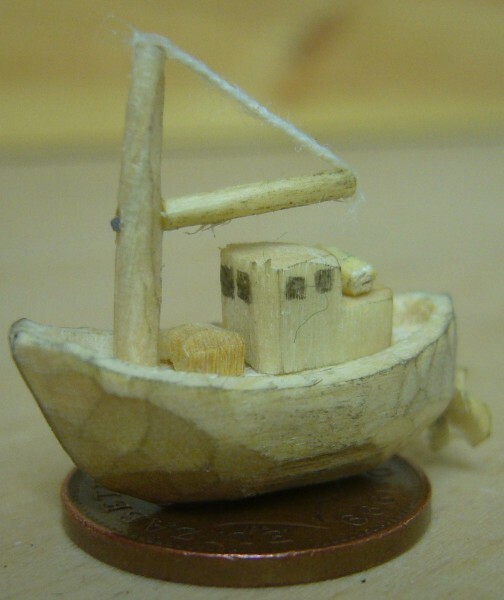 The mast and life raft were whittled from a matchstick. The prop shaft was made from a bit of staple salvaged from a magazine. It was loosely based on a picture of a genuine Stornoway trawler I found in a newspaper article. Something similar to this one. Before we left, I blu-tacked it to the top of a picture frame in the common room. I wonder how many people will spot it. The details for that hostel says no npbookings accepted in advance, but also that it is a two hour walk to get there, What if you arrive just before sundown, and they are full? I'm not sure. None of the Gatliff hostels take bookings; we were a bit worried about it before the first time we visited, but we've not yet had a problem. From what we've heard they always find somewhere to put people up even if all the beds are full. There are spare mattresses and space for camping near the hostel. The thing about walking two hours along a dangerous footpath to get there is slightly misleading. If you have a car/bike you can come in on the tarmac road practically to the gate of the hostel. Without a car, it is possible to walk in via the old track from Tarbert, which is what they are talking about. It used to be the only way in and out in the early days of the hostel, before the road was built in the early 1990s. It's quite a strenuous walk over a mountain pass (particularly if you're carrying a heavy pack with several days' food supplies) but features excellent views. A more practical way of getting to Rhenigidale without a car is to catch the bus that comes infrequently to the village itself (ISTR it comes twice a day except Sunday? ), or to catch one of the more frequent buses that travel along the main road to Stornoway, then get off and walk or hitch-hike the last four miles or so along the road to the village. There's also a local who offers a taxi service but it's very expensive - probably out of the price range of most hostellers unless there were several of you sharing the ride.